Some time ago I went to an event from Uriage. I got a few products to test out, so today I’m going to review the first product for you… I start with a review from the micellar water. Because it’s so important to purifies and cleanses the skin and also to remover all of your makeup in the evening. And this micellar water does it all, it cleanses the skin, purifies it and must remove your make-up. It’s removes face and eye makeup, so this sounds like the perfect multifunction micellar water! This thermal micellar water is for the combination to oily skin. It’s formulated with highly cleansing micelles and soothing Uriage Thermal water. It’s perfect to purify, cleanse the skin and remove makeup. It removes face and eye makeup and this all on a soft way. You can easy dose the micellar water on your cotton pad. It smells very fresh, I really love this smell! It’s so good during the night when you remove your makeup, it’s a smell that brings you till rest. With this micellar water you can perfectly remove your makeup and eye makeup on a soft way. I use this to remove my mascara another eye makeup. And also as a lotion in the evening when I didn’t wear any makeup or when I removed all my makeup to just clean my skin extra and to get all the last pieces of makeup from my skin. It works perfectly for that, and it also don’t dry out my skin but cleanses it well! Of course I also did a little test on photo… These are 3 long lasting products and on the second photo you can see how much this micaller water removes from the long lasting products after one rub. On the last photo you see the result after 3 till 4 time rubbing softly. Not bad at all! Especially if you know that the products I choose where long lasting and difficult to remove. So it’s works good and cleanses the skin fast. It’s a good micellar water that cleanses the skin so good. It’s also perfect to remove all your make-up and eye make-up. If you ask me then is this the perfect micellar water. It also smells so good and makes my skin soft. So yes, this uriage is for sure a stayer! They also have two other variants one for a sensitive skin and for the normal till dry skin. So for each skin type you have the right micellar water. And something else that is good… This price is fantastic for such and amazing product that also is very economical in use. 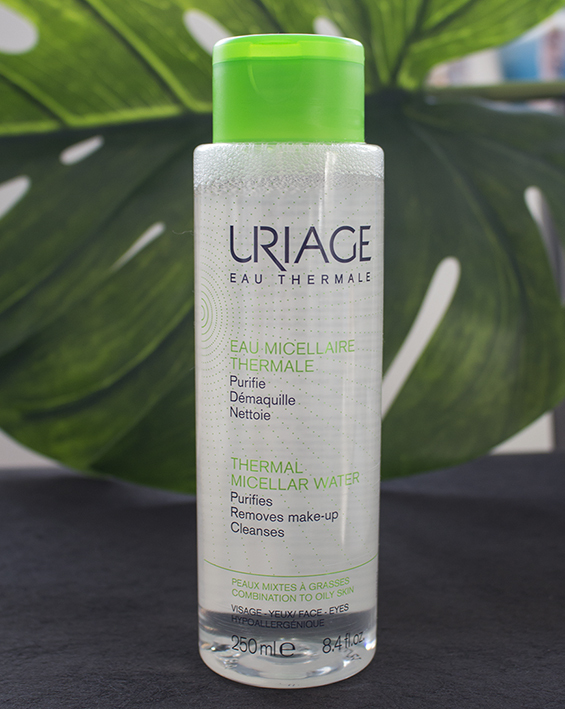 Uriage thermal micellar water contains 250ml and the price is €9,90. This micellar wáter looks amazing. Uriage is a stunning Brand! Yes, uriage is such an amazing and good brand!